My eyes flashed back and forth from my GPS’ screen to the water behind my spinner. Twenty minutes earlier a big musky had followed my lure to the boat and spun off, its aggressive movements indicating it would feed soon. I backed the boat out, repositioned 200 yards away, and retraced my route along the shoreline. With darkness falling, I zoomed in my GPS screen to keep my boat precisely over the track line on the screen. I synchronized the double-ten spinner so its blades were spinning the instant it hit the surface. Never mind that ten minutes before, I’d caught a four-footer on the same bait from the same shoreline. Was I greedy? Maybe, but there was another big musky that wanted to be caught and I figured I was just the guy to do it. The second big fish was positioned next to a large boulder on the tip of the island’s point. My bucktail splashed down and I felt the blades bump the boulder, then resume spinning, but they stopped again as the musky clobbered the bait. My hookset was solid and after a short tussle, the fish was in the net. I don’t enjoy that kind of success every day on the water, but I did a lot of things right to boat two big muskies in 20 minutes. The line between success and failure in musky fishing is razor thin, with the difference sometimes being as little as a single strike in a day’s effort. Small details thus become hugely important. Below are ten simple tips that could produce big results for you. 1. Boat control — Those who consistently boat big muskies rarely have any special retrieve magic that sets them apart from those who don’t. Usually, it’s a matter of boat control — if you place more of your casts where they need to be, you’ll catch more muskies. Boat control not only takes practice, but requires that you take note of what structure or cover the active muskies are using so you can find the next one. In some cases, if your cast lands five feet from where it needs to be it might as well be 50 feet away. In the opening anecdote, I used my GPS to show me what I could not see in the darkness. 2. Double-tens — Giant spinners remain the rage because they produce big muskies in never-before-seen numbers. Still, some think that by ignoring this trend they’re somehow smarter because the fish will someday become conditioned to double-tens. Maybe so, but I’ve seen many times when you’re costing yourself fish if you aren’t casting a double-ten spinner. Keep riding the wave. 3. Synchronize your bucktail — Thumb your spool as your bucktail nears the water’s surface to make it lay out flat and take up slack line, then immediately begin your retrieve as the bait splashes down. This will trigger muskies holding where you cast and prevent your bait from fouling on shallow structure or cover. 4. Don’t leave biting fish — Muskies can be remarkably easy or impossibly difficult. If you’ve just caught one, don’t move on to the next spot or leave the water to celebrate. If conditions are right for one big fish to feed, they’re right for others to do the same. Muskies often feed in packs, so if you’ve just caught one, another may be nearby. 5. Fluorocarbon leaders — Muskies have no idea what a leader is, but they seem to be more willing to strike a lure with a nearly-invisible fluorocarbon leader in front of it than one trailing a wire leader. I naturally expected fluorocarbon leaders to be more effective while fishing clear water, but when I saw them make a difference in stained water I became convinced of their effectiveness. Use fluoro leaders of 130-pound test or more for bite-proof durability. 6. Longer rods — Rods measuring 8 1/2 or nine feet produce longer casts, enhance lure manipulation, yield stronger hooksets, are more forgiving when fighting a big fish at boatside, and produce bigger figure-8’s. 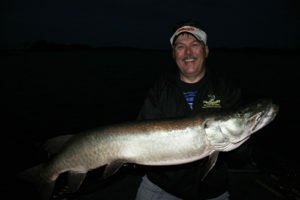 If any of these factors help you catch one or 20 more muskies this season, the longer rod will have proved its worth. 7. Vary your retrieve — The musky in the opening anecdote of this article may have been triggered by the lure’s blades skipping a beat when it bumped the rock. Adding any change to your retrieve, whether to speed up or slow down, change direction, cadence or depth, or add a twitch or rip, will give your lures more musky abuse than if you merely cast ’em out and reel ’em in. Regardless of lure type, I try to add at least one variation to every retrieve. 8. Keep your reel oiled — Besides prolonging the life of your reel, oil makes the casting process smoother, which limits backlashes. If you spend a fair amount of time picking backlashes every day you’re wasting time that could be better spent fishing. 9. Sharpen your hooks — A friend who works at a major northern Wisconsin sport shop tells me that about half of the lures returned to the shop have not had their hooks sharpened. New hooks are never sharp enough, and a beveled-edge file will make quick work of a necessary chore. 10. Bend out your lure’s tail hook — Slightly opening up the three hooks of the rear treble of your lures will stick just a little farther into a nipping muskie’s mouth and may mean the difference between catching it or not. Any of them could make a big difference.